Working woman is never been easy. As a woman, we always evaluates our priorities and decisions as daily basis. Especially if you're working mum. Making decisions or evaluates the priorities is not come easy. Sometime we think, everything is important and need to do it all. I heard few stories from my colleagoues about their quilty for their families and work. I'm grateful I'm single, no family commitment for this moment but I will in future so need to get ready early for that. So, as I mentioned earlier, I read one Bible apps that really inspired me to make this series on my blog. 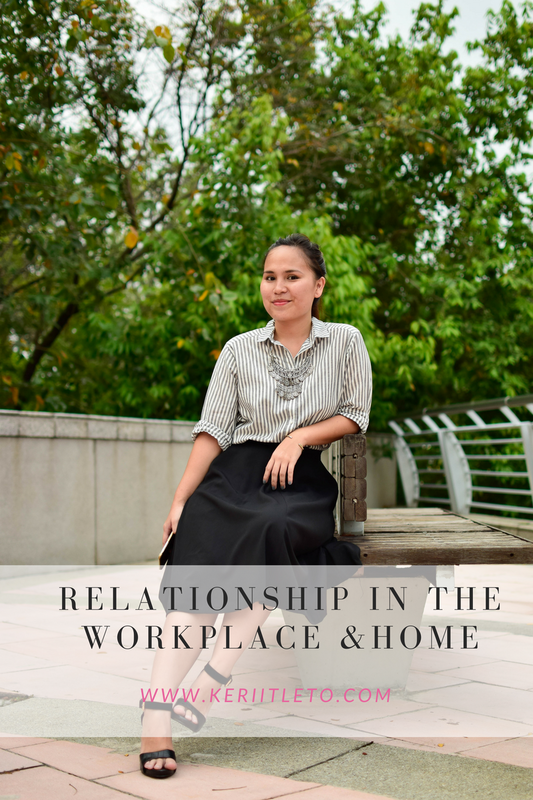 And, this time, we talk about relationship in workplace and home. p.s: I knew its not easy as I write this but try.At least, we know which is important. Family relationships are convenants with spiritual commitment and are thus eternal. Employees and employers come and go, but a mother's children are hers for the rest of her life or your responsibility as daughter or son is for the rest of life. Back in 2013, I faced this situation in my life. My work or my family. When my dad was sick in Hospital Sibu and everyone has something to settle something in their life so that time, I really need to choose to fly and take care of my father and mother. For me, that's the smart decision I ever made so far because I can take care of my father and mother as well. 2. Careers provide only part of woman's identity. Ultimately, a woman is not what she does but who she is, which is largely determined by her relationships to God and to others. Whatever your job, it's not define you're. It's just define you for few hours and who you really are is your relationship with God. When the inevitable feelings of guilt come, as the result of less than perfect choices, these principles of Scripture offer comfort. "A story about three servants". Everyone who uses what they have will get more. They will have much more than they need.But people who do not use what they have will have everything taken away from them. Those who are trusted with such an important work must show that they are worthy of that trust. Everyone expect perfection. Perfection is never possible, of course, but faithfulness is.God honors your efforts and intentions. He knows your weakness as well as your strengths. Neither your family members or your colleagues in the workplace see the big picture of your life. Only God does.Conversely, He alone knows the way to meet all of the needs of those with whom you live or work. A woman who is employed must acknowledged that she is obligated in certain ways to her employer, regardless of their spiritual state. For example, she owes her employer hard work.A Christian should always give a full day's work and never take advantage of employers by cheating them out of time and work that is owed to them. Every time you find work to do, do it the best you can. In the grave there no work.There is no thinking,no knowledge,and there is no wisdom.And we are all going to the place of death. Do your best to be the kind of person God will accept, and give yourself to him.Be a worker who has no reason to be ashamed of his work,one who applies the true teaching in the right way. We must be careful not to steal from our employers, doing everything we can to conserve their resources-both time and material assets. This is what happens to those who are greedy. Whatever they get destroy them.-Proverbs 1:19. We owes our employer loyalty. A Christian should not be found slandering or gossiping about her employer. Just as a woman must be willing to give an employer what is rightfully belonging to the employer, we must also give to God what is God's. For example, we do not owe our employer dishonesty of any sort, even if that employer should demand such. God requires a life of integrity and honesty,and an employer has no right to ask an employee to lie or deceive in any way..
Also, while a woman owes her employer an honest day's work,she does not owe all of her energy and time. She not only owes time and resources to God,but also God expects a balanced lifestyle with family and home priorities firmly established according to his divine order. Thank you for reading and I hope this article help you in your career journey.